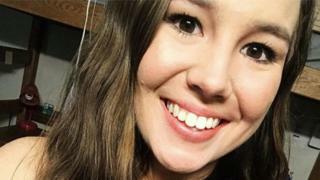 A Mexican immigrant accused of murdering Iowa student Mollie Tibbetts claims to have no memory of her death. Cristhian Bahena Rivera, 24, confessed to following the 20-year-old during her evening run five weeks ago. He said he "got mad" when she threatened to call 911, but cannot recall what happened next, police say. President Donald Trump has blamed US immigration laws for Ms Tibbetts' death, but the accused's lawyer said his client was in the US legally. The body of Ms Tibbetts, who went missing on 18 July, was discovered by investigators on Tuesday after they were led to the scene by Mr Rivera. Police say the suspect was living in the US illegally and had resided in the area around Ms Tibbetts' hometown of Brooklyn, Iowa, for at least four years. But Mr Rivera's farm employers said he had passed an immigration background check. On Wednesday, Mr Trump addressed the case in a video message posted on Twitter in which he attacked US immigration laws as "strictly pathetic". "A person came in from Mexico illegally and killed [Ms Tibbetts] - we need our immigration laws changed, we need our border laws changed," he said. "We have the worse laws anywhere in the world," he added, before appealing for funding to erect a wall along the US-Mexico border. According to a criminal complaint, Mr Rivera has admitted observing Ms Tibbetts during her evening run while dog-sitting for her boyfriend. Camera images had captured Mr Rivera's black Chevy Malibu "driving back and forth" near the scene where she vanished, according to the affidavit. Under police questioning, he admitted following her in his car, before getting out and running "behind and alongside" her, police say. The accused told police he panicked after she threatened to call police. He said he "blocked" the memory of what happened next, "which is what he does when he gets very upset", according to the charging document. His memory supposedly returned as he was back behind the wheel of his car. He said he noticed a headphone earpiece in his lap, which is "how he realised he put her in the trunk", says the criminal complaint. Officials say the accused then checked the boot of his car, where he saw Ms Tibbetts' body wearing exercise clothing and with blood on both sides of her head. He said he dragged her 60ft (20m) into a secluded corn field, and allegedly left her body face-up and covered with corn plants. What is the latest reaction? A statement from Ms Tibbetts' family on Wednesday said: "Our hearts are broken. "On behalf of Mollie's entire family, we thank all of those from around the world who have sent their thoughts and prayers for our girl." It included a request from the family for privacy. At the White House, spokeswoman Sarah Sanders called the death "an unfortunate reminder of why we need to strengthen our immigration laws". The White House also tweeted about the case, posting a video about family members of Americans killed by undocumented immigrants. On Wednesday, a judge at Poweshiek County Court ordered the suspect held behind bars on a $5m (£4m) bail bond. During the hearing, the suspect wore headphones to hear a Spanish-language translator, and answered "si" when asked if he understood the charges. The suspect's defence lawyer, Allen Richards, disputed official statements that his client was in the US illegally. "Sad and sorry Trump has weighed in on this matter in national media which will poison the entire possible pool of jury members," Mr Richards wrote in a court document, according to the Des Moines Register. Yarrabee Farms, where the suspect had been employed for four years, said in a statement he "was vetted through the government's E-Verify system, and was an employee in good standing". The farm in Brooklyn (population 1,500) is owned by a prominent Iowa Republican's brother. Owner Dane Lang wrote that he was "shocked to hear that one of our employees was involved and is charged in this case". According to the Washington Post, the suspect used a stolen ID card to pass the Department of Homeland Security's E-Verify system.